Our classic, die-cut, badge logo sticker. This original round sticker is great for any kegerator, briefcase, or car. pFriem bear face iron on patch, 1 3/4in x 2 1/4in. This quart-sized glass growler features a 24 karat gold pFriem logo. This half gallon glass growler features a 24 karat gold pFriem logo. Custom wood engraved pFriem Bear ornament. 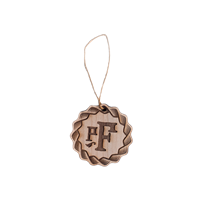 Custom wood engraved pFriem pF ornament. Black adjustable foam trucker style hat with a mesh back including embroidery side detail. A women's white paneled adjustable foam trucker style hat with a black mesh snapback. This unisex bear shirt is printed on Canvas shirts. This women's organic scoop-neck shirt features the pFriem Badge. American Apparel - Fine Jersey (100% Cotton) construction. Marled charcoal/black acrylic/rib knit beanie with reversible label. Women's cream knit pom-pom beanie with pFriem suede patch. The pFriem Brussels glasses feature 24 karat gold lettering, an 8 oz fill line, and offer the best experience with our belgian-style beers. The pFriem Willi glasses feature 24 karat gold lettering, a 12 oz fill line, and are designed with a slightly tapering rim to retain head, and concentrate the aromatics of beers like IPA, Blonde IPA, WIT, and other fine beers. Available in several sizes, these make the perfect gift for someone who loves beer and amazing food. Heathered gray, pF embroidered cap with a hop pattern brim. 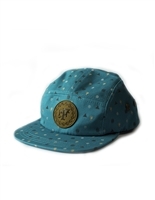 This teal blue, 5-panel camper hat is decorated with a PNW beer inspired pattern including Brussels glasses, barrels, hops, and mountains. 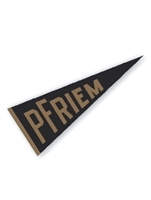 The front panel includes pFriem's signature pF on a suede patch and the back has a leather adjustable strap. Super old school meets modern style--this pFriem Grandpa Pinch cap has a 5mm rope to tie the look together. Flip-up buckram gives the crown it's unique structure & shape. The pFriem Brussels glasses feature 24 karat gold lettering, a 12 oz fill line, and offer the best experience with our belgian-style beers. 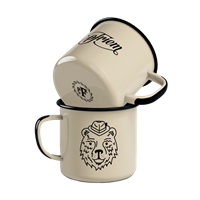 The pFriem Willi glasses feature 24 karat gold lettering, a 16 oz fill line, and are designed with a slightly tapering rim to retain head, and concentrate the aromatics of beers like IPA, Blonde IPA, WIT, and other fine beers.